Staying near a Norwegian fjord in May, I sketched several carved feather ideas after watching fishing loons, grebes, and cormorants. This is one of the five pieces that resulted. Just before diving, the bird expands with a deep breath. But it appears to deflate because at the same time, it compresses its feathers closer to its body. Acchh! Last month was only time in five years that I missed my two-week schedule of posting. The excuse is that I was traveling in Europe where I met some fascinating artists. Foremost is Nelly Saunier, the plumasier par excellence whom I have written about before. She attended school in France specifically to learn the skill of working with feathers. 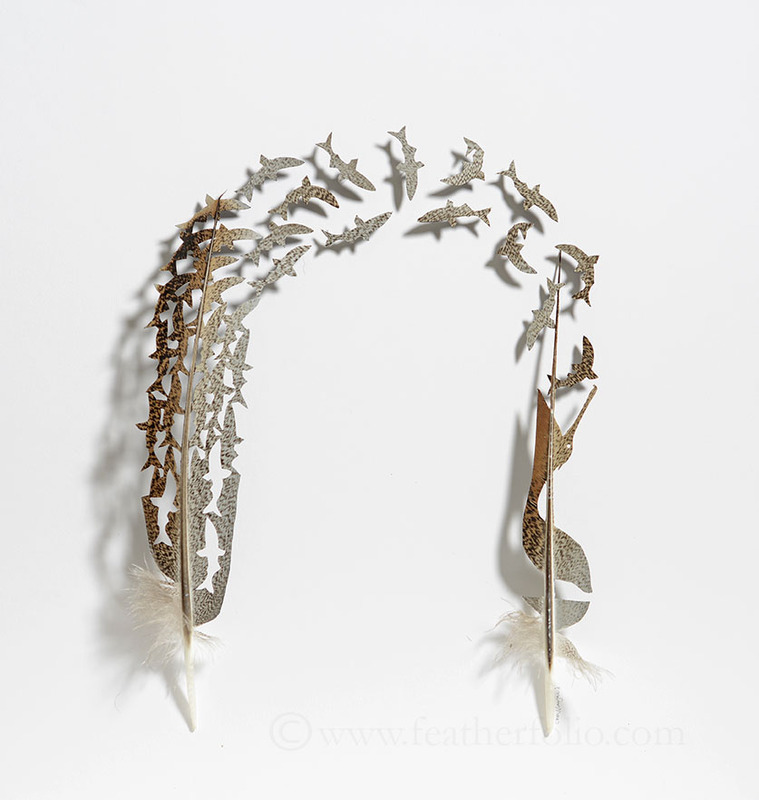 French even used specific words for each aspect of repurposing feathers into art and fashion. The passion to make this piece is in part from reading about Haida artist Bill Reid, and learning, about his and other cultures around the Pacific. These are people who live near the water and interact with it every day. Since all they could see was the surface of the water, they developed a feeling for existence that everything is covered by a membrane and what is on the other side of this membrane feeds them yet is hidden and a source of myth. For instance, I read that when a bear disappeared into its den and a fish is under the sea, they became bear and fish people with human qualities. Anyway, drawing this heron while watching one at the lake, I saw only reflections in the water and wondered how well the bird could see below the surface. A Capercaillie is a turkey-sized grouse from Sweden to Siberia. Recently, I have been fond of using their large, black tail feathers to depict ravens. I drew the original sketch with the lower wings and the tail as empty cutouts like the rest of the cutout birds on the lower part of the feather. It didn’t look right so I added back the lower wing and tail at an angle from the central shaft. Then placing the bird removed from the biggest cutout at the tip of feather made the piece seem unbalanced so I just put the tail of it in the upper right of the frame instead of the entire bird. This little change makes the entire piece read quite differently. Chickadee Heart . turkey feather . 12" x 12"
Keeping your arms straight, hands open, swing them fast around and around. Feel the air? For a bird, the thickness and palpability of the air must be a little bit like water feels to us when we swim. Birds need to feel the air currents going past the tips of their wing feathers to be able to respond to the needs of flight. Their long flight feathers act as levers, transmitting the sensation of air pressure to the nerves in the birds' bodies at the bases of their feathers. 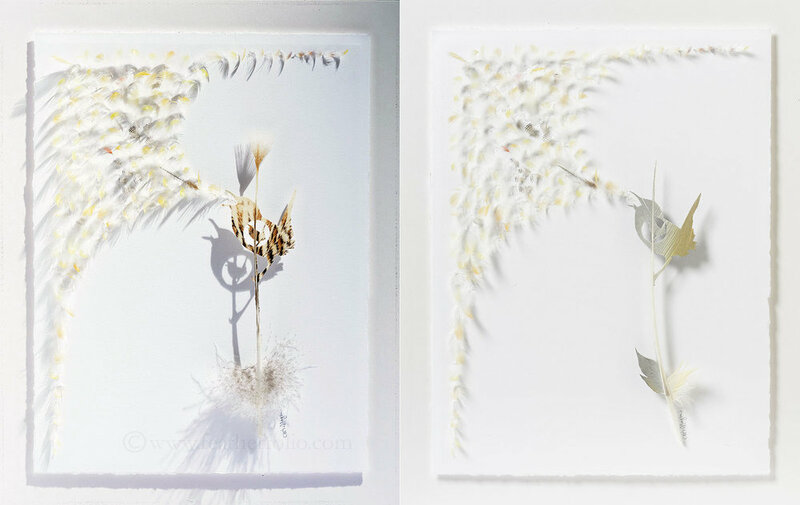 This large piece represents about one-tenth of all the bird families in the world. Carved into each feather is a bird or birds from a different family. The left row shows more or less the earliest existing birds to evolve; the right row shows the latest. 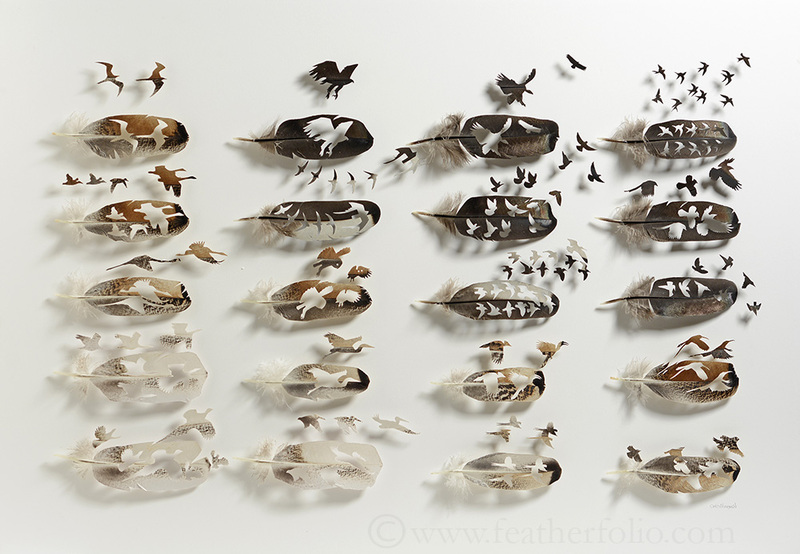 The top row of cut out birds are loosely the highest flyers, the bottom row are the lowest. This was commissioned by a natural history museum in late 2017 so the piece has a lined-up row feeling of a museum specimen collection. My great-great grandfather left five volumes of big “natural history” books from 1900 with thousands of photographs. Three of them picture and describe animals of the earth. Two of them picture and describe different peoples, different cultures of the world. My first reaction to these two volumes about people was distaste: these authors, pretending to be scientific (it comes off as objectively superior) wrote about societies different from their own, the same way they wrote about the animals with the same attitude. That said, I find these two books fascinated and endearing for the diversity of human cultures in 1900. Most of the animals pictured and described in the three volumes are still with us (though often diminished in number) but most of the cultures they portray are gone or greatly diminished. Which means that the art associated with these cultures has also faded. Art tied to culture is what art has been all about. Now with vanishing cultural diversity and living in a much more globally connected world with little in the way of a cohesive culture except consumerism, where is art? What ties creativity together? What does it mean to make art today? How can art have meaning for us? My choice of medium has been a blessing in that feathers have been part of the human psyche and woven into our cultures forever. Though our cultural roots are withered, the feathers and what they mean to us remain. We will always want to fly. 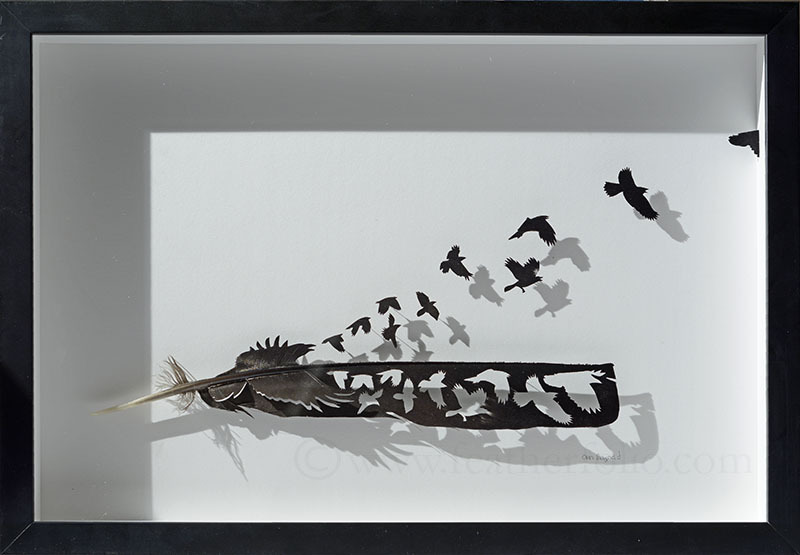 I see a larger role for natural materials including feathers in art’s future toward reviving connections with our roots and with the natural world. Singing Bird 33 . 14" x 11"
I often redo work I am not satisfied with. Or sometimes I just destroy it. Painting over a piece is not an option so if I can, I readjust or recut feathers. The piece on the right I did not like so I removed and discarded the carved singing bird I had made in 2016. I cut a new feather which I am pleased with. The finished piece on the left has the same name. Should I write on the back “2016” or “2018” or use more words and say “2016 but redone in 2018”? Self Knowledge . turkey feather . 12" x 9"
Before I seriously began my professional art life, my work involved negotiating with the hydropower (dam) industry for which I received an average of about ½ a compliment per year. At my first solo art show, compliments for my work was one a minute. I found this attention a bit intimidating at the time. So I ducked out for a moment to call my sculptor friend Ross Matteson. All he said was, “Just be grateful that people like your work.” That advice stays with me every day. Grebes eat a lot of small feathers, their own shed feathers and plumes floating on the water. They feed them to their chicks too. Feathers may be the first thing that the chicks eat. The thought is that the feathers protect the birds’ stomachs from pointy fish bones—until the bones are soft enough to go through the rest of the way. The feathers may provide some health benefits too. Ron Dudly writes a little more about it on his photography site and the Wilson Journal of Ornithology has more yet. Pelicanesis . turkey feathers . 20" x 19"
Life offers two features in abundance: beauty and horror. So how does a sane person cope? Focus on one side of this, the beauty? Watch horror movies? Emphasize sacredness and specialness of existence? For me, I find an underlying theme of humor provides some balance. People often say that my pieces have a bit of comedy. I don’t usually try to do that but I like it when a piece makes me smile. Especially when the title fits. The darkest days of year are for gathering around the fire. Shining out of fireplaces and windows of wood stoves, and on the floors of teepees, wigwams, and longhouse. Since darkness reins, our tendency toward telling stories and seeing the world as myth comes forth. Normally unnoticed shadows become prominent. The sun is gone so the fire becomes its substitute but shining from below. Which encourages the shadows to dance around and above us on the walls. This is my first borrowed north-west coast native design style, modified for use in a carved feather. Each piece is a result of a long and careful series of eleven steps before it finds itself completed. Inspiration comes from many sources, some take longer than others. It might be a two-week trip to see a particular bird or it might come from a flash of insight from casual conversation. Obtaining feathers takes years. I like molted feathers from aviary birds. I am fortunate to know dedicated people who take the time to pick the feathers up and send them to me. Some feathers are harder to come by than others. Also, I pay close attention to the laws about which feathers are legal to have and to sell in artwork. Selecting feathers. Damaged plumes are not usable and often, the majority of feathers I get are in some way damaged. Each bird’s say 10,000 feathers are of all different sizes and colors and I need the exact right size, pattern, and color. Preparing the feathers. The feathers in perfect shape get washed and sanitized. Each feather gets preened, kind of like the bird does it to make sure the barbs are all interlocking. Most body feathers have a little plume called an aftershaft which I usually, but not always remove. 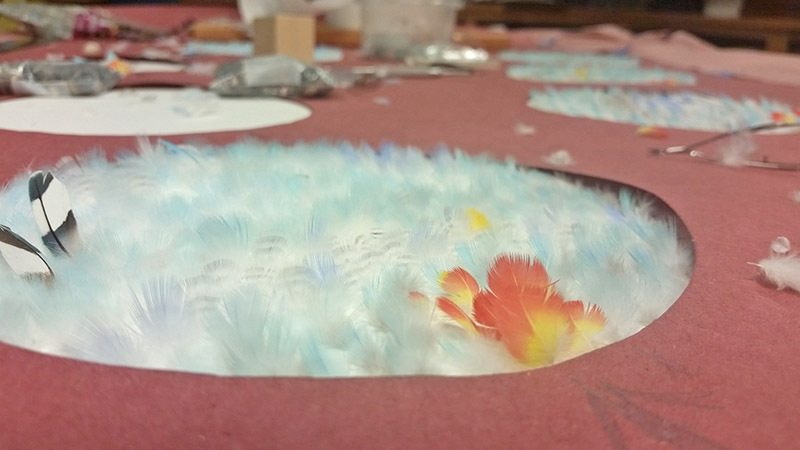 The cutout feathers are backed with a combination of glues, papers and pressure. 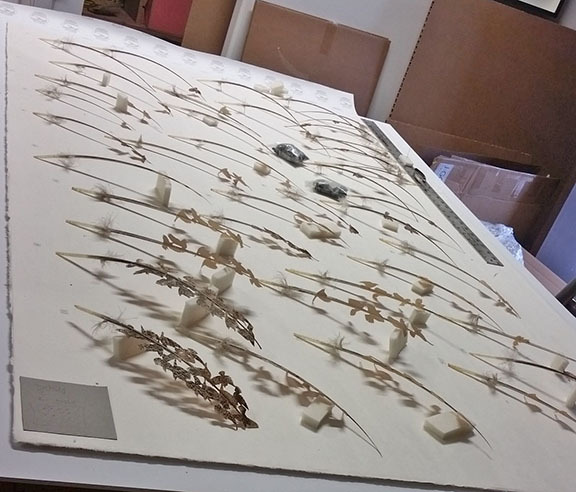 Designing the layout happens throughout the process but it helps to have the feathers ready in hand to get a feel for the dimensions which are dependent on the size of the feathers. Making the design. I begin with a simple sketch, which I may have jotted down previously. Then I refine the sketch and place it in the computer. I take a picture of the feather and put it in the computer and size the sketch to fit the feather. This becomes my template for cutting. Making the background which is usually archival quality foam core with laminated white cotton papers. Arrange everything on the background because the feather and the cutouts are my only lines and shapes, the layout step is very important to end up with a pleasing unity. 1Mounting the feathers is a process of gluing and pinning to the background. “How long does it take to make?” is an often-asked question of an artist during a show. It is difficult to answer because making art is not usually a linear process. Sometimes and artist will answer glibly, “All of my life.” Which is true in the sense that an artist learns and gathers skills throughout their life. But it is not very helpful to the questioner. When I am asked, I try to gage the level of the questioner’s interest. If it is casual question, I answer with, “It’s a long process.” If the questioner is more seriously interested, I go through the steps in the process from inspiration to photographing the final piece. But I find that for me, the question is often aimed at finding out how long it takes to cut the birds out with my scalpel. The November 2017 print issue of National Geographic Magazine has an article on Pterosaurs, flying dinosaurs like pterodactyls. They say that there existed many species of all different sizes including one with a wingspan of 35 feet, as tall as a giraffe. That impressed me. Partly because I have understood that the heaviest flying bird could be only around 40 pounds. Otherwise, it couldn't get off the ground. Although several people have explained the physics of bird flight to me, I don’t understand how something much heavier like a giraffe-sized pterosaur could fly. Can anyone provide answers? Swans are closer to the limit of how heavy a bird can be and still fly at 30 pounds. A swan expert theorized that their feathers are so thin as to be translucent because this saves weight to allow the bird to be able to fly well. We make sense of our place in the universe in many ways: science, religion, philosophy, stories, our own experience, myth, and art. 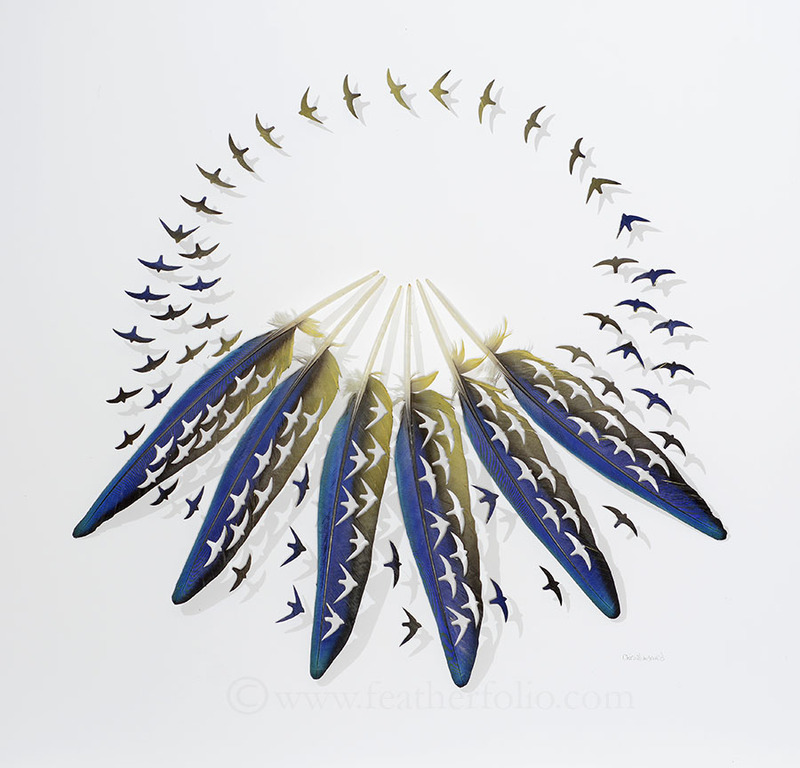 Feathers have always symbolized flight, transformation, aspiration, and hope as well as beauty and wonder. If the meaning we ascribe to feathers are useful in some way to make sense of our existence, we will always use feathers as major symbols as long as we and birds inhabit the Earth. Feathers universally represent the ability to fly. So I was pleased to create a commissioned piece to be placed at the Philips Arena, home of the Atlanta Hawks because getting close to flying is a goal of a basketball team, especially one called the Hawks. Flight is also an aspiration of the fans, we want our team to metaphorically fly, to do their best -- and surpass their best. Each feather can symbolize flight. A team of them on two wings working together can accomplish flight. 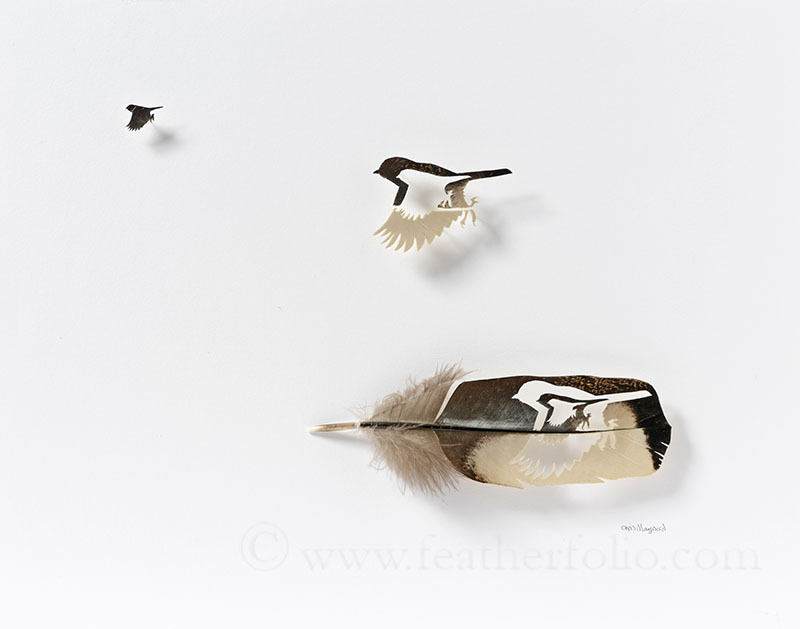 Feathers are the central trunk or shaft of my artistic focus. Though I am not branching out to other media, I compare how feathers branch out to trees, arteries, nerves, and river systems. Isn't a defining factor of these branching systems a process of getting from one place to another and maintaining continuity? For a feather, it begins as a little nubbin in a bird's skin, then grows into a branching system that creates a structural continuity. Nerves send signals back and forth. Trees, blood, and rivers are continuous flowing liquids. As a creative person, I occasionally visualize off-beat scenarios. Like a a bird or a person stripped of everything but their circulatory systems and looking a bit like a branching feather.